A close-up of pale pink and white dogwood blooms, with yellow pistons, result in a delicate photograph on a dark background. The blossoms, which are common in southern areas of the United States, are symbolic of spring and the Easter holiday. For many, the beautiful blossoms have religious significance. While most people think of dogwoods as small trees, the genus also includes some shrubs and perennials. Because of their size, dogwoods are a common favorite in small gardens. Many dogwood trees have beautiful flowers in spring and leaves that change color during the fall season. Common types of dogwood include the pagoda dogwood, Eddie's White Wonder, and kousa. The pagoda dogwood is from eastern North America, and is known as one of the most beautiful of the smaller trees. The tree has a unique, tiered appearance that is frequently compared to a wedding cake. This type of dogwood grows slowly, and must be staked in order to grow upright. Eddie's White Wonder is a cone-shaped tree with flowers that are white in spring, with leaves that turn colors in the fall. The kousa variety, which is native to Japan and Korea, is known for its white flowers in fall, wavy-edged leaves that become red in fall, and red fruits. 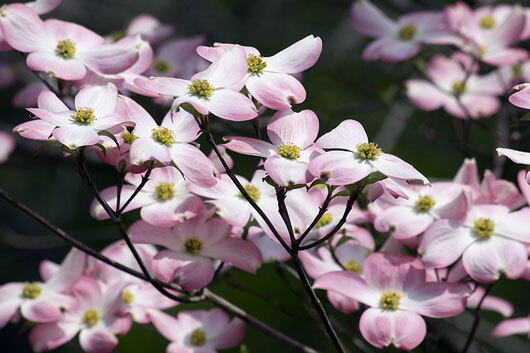 Dogwood thrive in neutral, fertile soil, in sun or light shade.